The West Cascades ecoregion is sparsely populated but long utilized. Human history in the West Cascades dates back at least 8,500 years when the montane glaciers began to recede. Tribes from both the west and east sides of the Cascades gathered huckleberries in the summer and fall. They hunted large and small game, from elk and mountain goats, to pikas and porcupines. The Nisqually, Puyallup, Squaxin Island, Muckleshoot, Yakama, and Cowlitz are among the peoples with long ties to the ecoregion. The search for a wagon route over the Cascades led to some exploration of the West Cascades near Mount Rainier in the 1860s. That effort eventually resulted in settlement near Packwood in the 1880s. In the generations since, the timber industry has provided livelihoods. Agriculture, particularly grazing and hay production, continues in the river valleys. Tourism has played an increasingly important role in recent years. Nearly two-thirds of the ecoregion is public land, most of it federal. 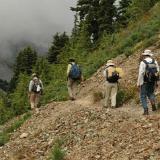 The ecoregion features numerous protected areas, including Mount Rainier National Park, Mount Saint Helens National Volcanic Monument, and several Forest Service wilderness areas.